Making your own cheese is always an adventure. This is the simplest possible method, but there’s still something magical about it, about how warm milk just splits apart with so little provocation and turns into something completely different. From this humble start, curds forming in a pan of milk, come all forms of cheese. The simplest jibneh layyin and the most exquisite Roquefort all start in that pan of milk. 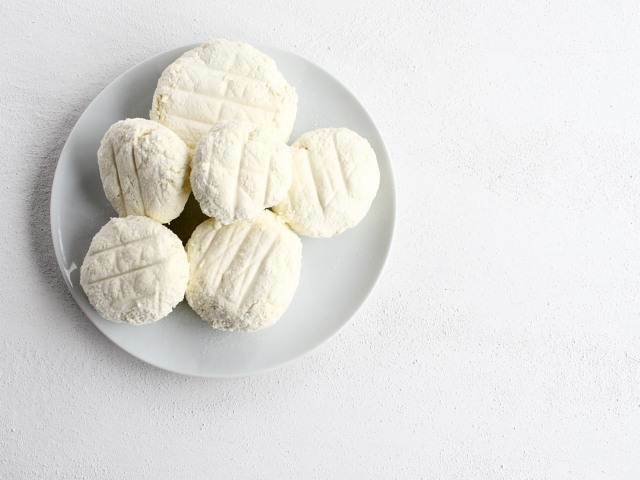 Loose, open textured cheeses like this one are common all over the Middle East, where they’re eaten with vegetables or just as simple table cheeses. There are similar versions in other parts of the world, such as that Indian classic, paneer, which is made in nearly the same way. The method is simple, and it’s a great place to start if you’ve got designs on more complicated cheese making. Essentially, all you need to do here is curdle milk and collect the curds together into balls, but you’ll learn something of the technique and the way that milk behaves and reacts through the cheese making process. Four litres of whole milk will make about ten or so small cheeses. Warm the milk in a large pan until it reaches 43c. This isn’t particularly hot, and you should still be able to put your hand into the milk comfortably. Take the pan off the heat and add four or five drops of liquid rennet, dissolved in a little water. Rennet can be hard to get hold of – try health food shops, or more likely, look on the Internet. I bought mine from eBay. If you can’t find rennet, you could just use lemon juice – the juice of half a lemon will have much the same effect. Stir the milk for a minute, then cover with a lid and wrap the pan up in a couple of towels or blankets to keep it warm. Leave it to sit for an hour, during which time the milk will coagulate to form curds and whey. The curds need to be separated, so pour the whey off through a sieve lined with muslin. Push as much of the liquid out of the solids as you can before taking handfuls of the curds and pressing and squeezing them into small balls…think a bit bigger than a golf ball, and slightly flattened. More whey will be pressed out of the cheese as you squeeze it into shape, but rest the cheeses on some muslin on a wire rack in any case to let whatever liquid that might still be there drain away. Transfer the cheeses to a plate, loosely cover them with muslin and refrigerate for a day to let them firm up and mature slightly. The cheeses can be salted to taste and eaten at this point, or kept for longer by steeping them in brine in a Kilner jar. Make the brine from cooled, boiled water and sea salt, one tablespoon of salt to each litre of water. Make sure that the jar has been thoroughly cleaned and sterilised. The cheeses will last for at least a week in the jar in a fridge. This might be cheese in it’s simplest form, but it is cheese. Rennett isn't that hard to find these days – I've seen it in my local Sainsbury's & Waitrose, usually near the glycerine & flavourings in the baking aisle. I couldn't find it anywhere…went to every supermarket I could reasonably get, but nothing. There must be a lot of cheese makers in York…. Is not rennet non-vegetarian though? I'm too lazy to google but it's cow's feet? There are vegetarian and non-vegetarian versions of rennet. The non-vegetarian version is made from an enzyme from a cow\’s stomach that\’s normally there to digest milk. I have found doing this with lemon juice results in a Farmer-cheese variety, and it is delicious on almost anything–texture of ricotta, sourness of yogurt, creaminess of sour cream. Mmmm.